A near-flawless audio-visual presentation and fascinating ideas make Blade Runner 2049 Villeneuve's best. 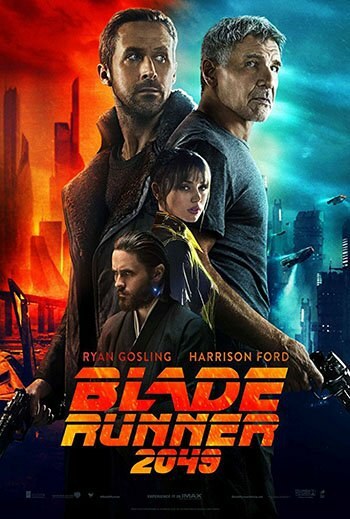 Blade Runner 2049 is the 35-years-later follow-up to Ridley Scott's 1982 sci-fi masterpiece Blade Runner, but to look at it exclusively through the lens of its predecessor runs the risk of overlooking its singular virtues. More than being a Hollywood sequel, this is the latest film from Denis Villeneuve (Arrival, Sicario, Prisoners), who over the last several years has steadily grown into one of the most inspired filmmakers in the big-budget arena. Does Blade Runner 2049 live up to the towering legacy of the original? Yes, and then some. But it also continues Villeneuve's overarching artistic vision, telling a pensive, brooding story steeped in existential dread and wonder, with rich characters and a cinematic style so moody and overwhelmingly powerful that it'll make you tremble and forget to breathe. Villeneuve's movie is in many ways more flawed than Scott's: the pacing is occasionally too methodical, the action sequences are far less compelling than the ruminative, poetic moments, and the script is anything but seamless, with some plot machinations feeling herky-jerky and contrived, a stark contrast to the flowing visual and aural presentation. But in other ways, the sequel is better. While the movie's art, set, and sound design take major inspiration from the neo-noir aesthetics of the original, Villeneuve and cinematographer Richard Deakins' (still one of the best in the business) vision of near-future Los Angeles is even more lived-in, haunting, and beautiful. And Ryan Gosling's lead performance is actually better than Harrison Ford's was in the 1982 film, which isn't a knock on Ford but rather a testament to his successor's gifts. Gosling plays K, a replicant, LAPD “blade runner" ordered to hunt down rogue replicants by his boss, Lt. Joshi (Robin Wright). In the 30 years since the first story, the evil Tyrell Corporation has been superseded by the Wallace Corporation, who have manufactured a new-generation of replicants -- like K-- who have been engineered to be perfectly obedient to their human handlers. Stuck in the muck of blind servitude, K is a sauntering embodiment of ennui, as unfulfilled and unenthusiastic about being a 'blade runner' as Ford's Deckard was. The misery and monotony of the job is interrupted, however, when K finds a tantalizing breadcrumb from the past that sets in motion a string of sleuthing that leads him to a shocking revelation. Depending on which version of the original you subscribe to, Deckard may be a replicant, or he may not. That creeping ambiguity, that looming question of the nature of reality, was the secret sauce that made the first movie so special. We know for sure that K is a replicant within the first few minutes of Blade Runner 2049, but as his epic journey unfolds, he's put through an existential crisis even deeper, more harrowing, and more thought-provoking than Deckard's, which is saying a lot. The themes and ideas swirling around in Hampton Fancher and Michael Green's script are extraordinarily rich and relatable to anyone who's ever, even for a moment, felt like a stranger to his or herself. This is powerful stuff, and while the messaging can occasionally feel long-winded and hollow, Villeneuve and Deakins' imagery makes the weaker scenes at least visually captivating. And there isn't one frame of this film that isn't a feast for the eyes. The violent contrast of blackness and brilliant geysers of color drives the visuals throughout, with the strong geometry of the environments structuring the neo-noir shadowplay. Like all good sci-fi, the futuristic imagery is as meaningful as it is pretty; while roaming the drenched LA streets, K's face is occasionally set aglow by gigantic neon holograms of naked women seducing him into dumping his money into a futuristic companion app, a keen insight into the current trajectory of modern technology. The defining characteristic of the original film's set design was that every building, room, and prop had a distinctive sense of weight. Villeneuve and co. up the ante in that respect, with each piece of every set feeling organic and grounded despite the artificial nature of the milieu. While the film as a whole isn't without its flaws, you'd be hard-pressed to find fault in the visual presentation of Blade Runner 2049's imagined future. The film's look owes a lot to the original, but Villeneuve and Deakins have their own vision, which speaks to the issues and anxieties of today. The aural presentation, too, is something to be treasured. The sound design is immersive and gives the images added dimension, and the moody score (by Benjamin Wallfisch and Hans Zimmer) emboldens -- but never gets in the way of -- K's story. His most intense encounter takes place inside a dilapidated nightclub showroom, with the venue's malfunctioning speakers puncturing dead silence with sudden, ear-piercing stabs of music that leave eerie echoes in their wake. It's a sequence that wouldn't feel out of place in a horror movie, and all of that terror can be attributed to the incredible implementation of sound. As was revealed in the trailers, K and Deckard do eventually cross paths, and the actors maximize every minute of their screen time together. Ford has become a much more internal actor with age, and internal acting is sort of Gosling's thing, so the matchup feels natural. Jared Leto plays the mastermind behind the Wallace Corporation, a sort of distant demi-god who's always babbling about creation and the cosmos. It's a solid performance for the most part, but some of his speeches feel so drawn out and meandering that one wonders if they should have been cut short (or cut altogether) to help alleviate the film's massive 163-minute runtime. Any film that approaches three hours in length runs the risk of losing the undivided attention of its audience, but that's a risk filmmakers like Villeneuve are happy to take. The story plays out methodically, at a pace unconventional for sci-fi thrillers but absolutely necessary for ruminative movies like this. That being said, Blade Runner 2049 is anything but a slog; it's full of surprises and game-changing revelations. While it'd be impossible to divulge those twists and turns without spoiling the experience, one surprise I can discuss is Ana de Armas, a little-known actor who plays K's love interest and closest confidant, Joi. de Armas is phenomenal and almost scene-stealing in this role, and the way the film explores the nature of intimacy and desire via Joi's relationship with K is jaw-dropping. Blade Runner fans will likely be divided in their opinions of Blade Runner 2049 and how it stacks up to the original. It's not a perfect movie (mostly due to a couple of needling plot contrivances and unremarkable performances), and only time will tell whether it'll have the legs of the original or achieve the same modern-classic status. But fans of Villeneuve will surely consider it a triumph. It's the most purely cinematic movie he's made yet, and in today's big-budget landscape, pure cinema is harder to come by than ever.